Beneath the Navman S200’s amazingly slim frame and super-flat widescreen is a suite of powerful features and the latest maps of 22 European countries. The Navman S200 also features 3D landmarks and motorway Junction Views make travelling to and navigating major towns and cities easy, while the built-in NavPix feature gives you access to over a million geo-tagged photos so you can really explore your destination. And with Infobel Local Search, get even more information on exactly what you’re looking for from sightseeing, shops, hotels, restaurants and much more. Navman S200 has been discontinued. Accessories, spares and parts are still available for your S200. 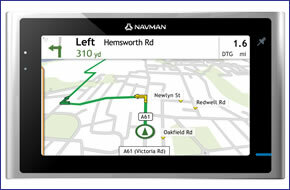 The Navman S200 is part of Navmans Spirit range and features maps of UK and Western Europe pre-installed. The Navman S200 also features a brilliant, sharp 4.3-inch colour widescreen touch screen display, integrated Bluetooth module, points of interest, speed cameras and intelligent day/night display. The Navman S200 features turn by turn navigation with voice guided instructions and a full 8-digit UK postcode searches with 2D and 3D moving map display. Plus, with the Navman S200, you can navigate via images with 'NavPix'. A NavPix photo carries its exact location data, which your Navman uses to navigate to - handy if you don't have the address or postcode of famous places you would like to visit. For example, who knows the exact address of the Eiffel Tower, the Tower of London or the Brandenburg Gate? By combining images with geo-referencing, NavPix lets you use images, such as the Eiffel Tower, as points of interest (POIs). You can then use those NavPix images when planning routes on your Navman S200. Navman S200 also provides real-time traffic information via the traffic module. The Navman S200 traffic cradle uses the Traffic Message Channel (TMC) which broadcasts real-time traffic and weather information via the FM Radio Data System (RDS). FM radio stations transmit traffic information updates on a regular cycle, particularly around rush hours, with up to hundreds of events broadcasted to TMC receivers. Your Navman S200 will decode these events and display the various events and give you options on how to avoid traffic congestion in the road ahead. The Navman S200 traffic module works in the following European countries: Belgium, Germany, Denmark, France, United Kingdom (except Northern Ireland) and the Netherlands. Navman S200 is pre-loaded with a free trial of the Navman UK speed camera database. The latest safety camera data is fully integrated with the Navman S200. Colour coded speed camera icons are displayed on the Navman S200 so you can easily recognise the type of speed camera on your route. You can also select your proximity range allowing you to decide when you should be alerted of an approaching speed camera. Navman S200 has been designed to be Plug and Play, and as such can be transferred from vehicle to vehicle with ease by the user. The Navman S200 is powered with a 12-volt adaptor cable in-car (supplied) and attaches to your vehicles windscreen via the Navman S200 suction mounting bracket which is also included. Navman S200 includes a free preloaded trail to speed camera locations. Subscribe to monthly updates of speed camera locations for the United Kingdom. Subscription to the Navman UK speed camera database is priced at £34.95 for 1 year or £69.90 for 3 years. The Navman Western European speed camera database is priced at £49.95 for 1 year. The Navman S200 is complete with the latest Navman TeleAtlas maps providing detailed street level maps of the United Kingdom, Eastern and Western Europe. Although the Navman S200 has been discontinued, a number of accessories are still available to buy from ActiveGPS. These accessories and spares include: carry case, vehicle charger, windscreen mounting bracket and earphone adaptor.